Tropical rain forest full of trees where seems nobody has been to. We imagined secretive place of deep inside of the forest. 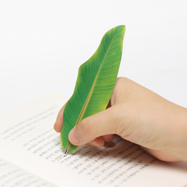 As bookmark pen series this time is the product expressing natural tropical rain forest itself untouched by humans, we put our wish for you to feel the mood of dense forest with the product. It’s not easy to go to the forest. But feel the unknown world in the closest place to you.